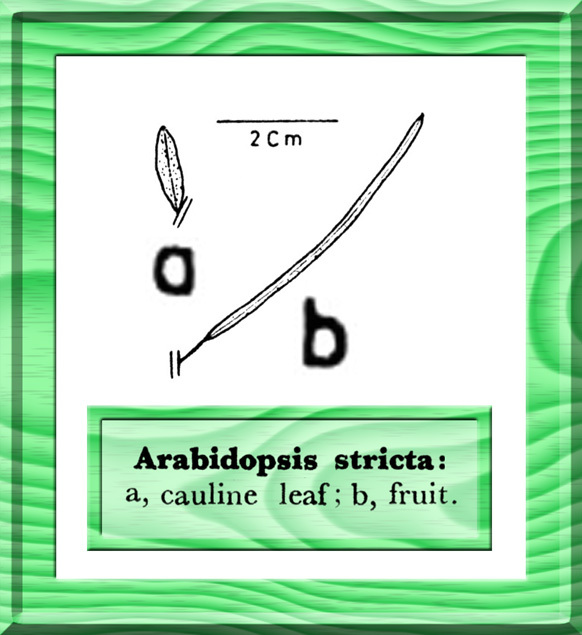 Arabidopsis stricta (Camb.) N. Busch, Fl. Cauc. Crit. 3. 4: 457. 1909. Schulz in Engl. & Prantl, l.c. 641; Hedge in Rech. f., l.c. 333. Sisymbrium strictum (Camb.) Hook. f. & Thoms. Annual or biennial, 30-50 cm tall, erect, branched, rigid, clothed with short, branched (stellate), somewhat scabrous or rough hairs. Lower leaves oblong-spathulate, 15-60 mm long, 5-15 mm broad, toothed to entire, cuneate below, shortly stalked to sessile; upper leaves oblong-linear, sessile, 10-30 mm long, 2-6 mm broad. Racemes 30-60-flowered, often bracteate below, up to 30 cm long in fruit. Flowers c. 2.5 mm across, pink or lilac, rarely white; pedicels 5-10 mm long in fruit, filiform but rigid, spreading. Sepals c. 2 mm long. Petals c. 3.5 mm long, 1 mm broad. Stamens c. 2 : 2.5 mm long; anthers c. 0.3 mm long. Siliquae 20-40 mm long, c. 1 mm broad, linear, terete or subcylindrical, glabrous; valves distinctly 1-veined; style 0.5-1 mm long, with a short depressed stigma; septum not veined; seeds 20-30 in each locule, c. 0.7 mm long. Type: N.W. Himalaya, Simla, Jacquemont (P, K). Distribution: Himalayas, Pakistan, Afghanistan and C. Asia.